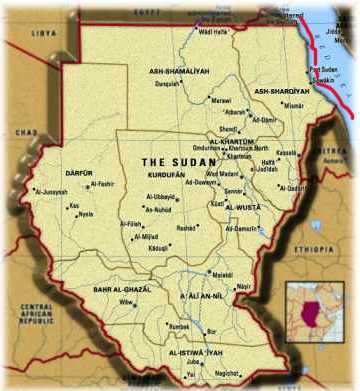 Sudan is another very poor country, kept that way by internal strife. 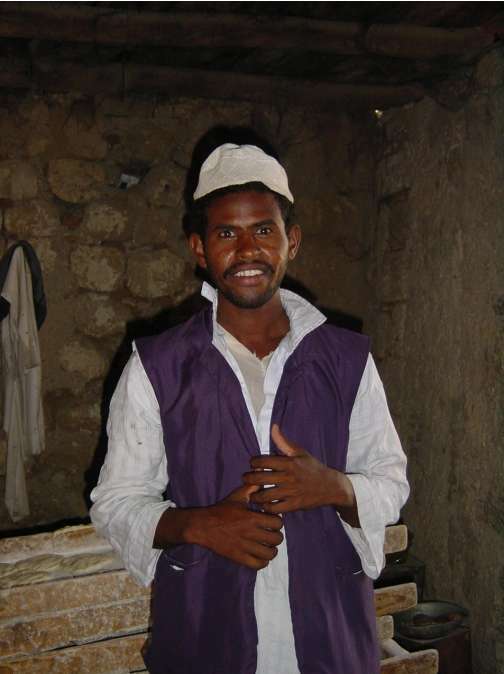 We found Suakin a delightful port and watching the village come to life each morning was like a peek into the past. 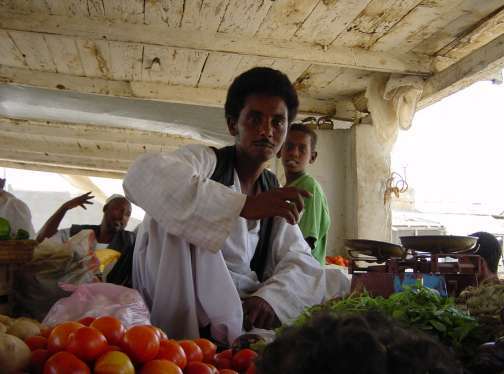 Port Sudan was busy and dirty, and a revisit is not in the cards. Sudan - The Country - This country, like many in Africa, seems to be in a perpetual state of war - fortunately when we were there, it seemed to be in a lull. The country is poor, normally ranking in the bottom 10% with regard to per capita GDP. We only visited a couple of port cities along the Red Sea and were sorry not to have visited Khartoum at the confluence of the Blue and White Nile rivers. The northern portion - Nubia - rivaled Egypt in grandeur 3000 year ago. Despite its poverty, the Sudanese people were friendly, honest and we saw no begging or outright hunger in the cities we visited. This was a wonderful place to stay for a few days. 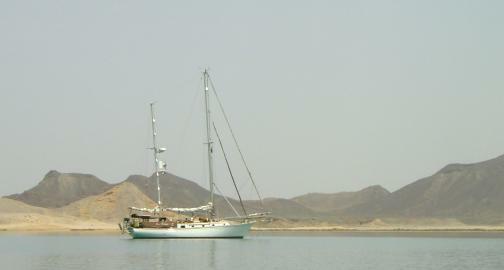 The yacht anchorage is at the end of a 2-mile inlet in the shadows of ruins of the old town - abandoned when the British moved the main port to Port Sudan. Ferries visit from Saudi Arabia and we had to scoot around their anchor chain to find our anchorage. Inside we were met by Mohamed, naturally, and he took care of all formalities - seems he also works for Customs, and handles yachts as a moonlight job. Each morning we awoke to the calls to prayer and watched the village women come down to the seaside for the morning bath. It was all prim and proper and seemed to be a socializing time of the day. On a walk through the town of 1000 or so, we were invited into the local bakery to watch the men put loaves into an ancient stone fireplace, probably unchanged for hundreds of years. A vendor at the local vegetable market (good, fresh produce) insisted on posing for Judi with a cup of tea in his hand - we took him a print the next day as a thank-you. Street vendors selling spices of all varieties. A barber invited us in for a chat and soda. Tailors with their machines on the streets for instant hemming or repairs. Peanut butter by the pound - reputed to be a little sandy, but it looked good. On the outskirts of the city, Bedouin camps lined the road where people lived in tents in the desert, and only a few had vehicles - camels were the normal transport. Long Island, a delightful anchorage with pink flamingos and ospreys among the plentiful bird life on the island. Marsa Fijab, 25 miles north of Port Sudan this marsa had a 4WD parked on an 'island' with snorkelers in the water. It also sported a family who rode their camel to play in the sand, boys offering shells and camels rides (we declined and offered them some provisions), and fishermen asking for water (they gratefully accepted 5 gallons). Khor Shin-ab, with three miles of twisting channel to a spectacular anchorage with hills on all sides. The waters have turtles, dolphins, and coral gardens and flamingoes wading in the shoals. On the shore camels wander looking for something to munch and the occasional truck lumbers by on the dusty coast road. We hiked to the top of the nearby hill and had great views of the anchorage and surroundings. For more information, check out our April 2003 or May 2003 log pages or move on to Egypt, our next stop.